Esalen (Big Sur, California) here I come! Iâ€™m looking forward to going to Esalen at Big Sur, California on Sunday. Iâ€™ll be there for five days to attend a poetry workshop led by Ellen Bass, Dorianne Laux, and Joseph Millar. Iâ€™ve taken this workshop several times before so I know what to expect â€“ lots of poetry writing, sharing what we write late each day, and always very gentle, encouraging feedback. Iâ€™ll also know several of the people there. Like me, they are Esalen and poetry junkies. Although I usually like to go to Esalen at least once a year, this will be my first time in almost two years. Perhaps the work of my book got in the way last year â€“ definitely a poor excuse. Because my mantra is always: â€œTake care of myself,â€ I never should have let myself skip a year. But Iâ€™ll make up for it very soon. Usually I go to Esalen without my husband, Bob. The last time he went was to celebrate my sixtieth birthday there. Hereâ€™s the piece I wrote about that time over a decade ago. As sixtieth birthdays go it wasn’t too bad. But how would I know any difference? This was the first and last time I’ll ever turn sixty. Bob kept toasting me with a “here’s to another sixty years.” Ha! Now, that’s a laugh. I know I feel pretty good, but another sixty is stretching it a bit, don’t you think? I decided to spend my birthday at the place I love the most – Esalen Institute on the Big Sur coast. I turned down a party. I just couldn’t get behind the idea of a celebration this year. My sister insisted, Bob insisted, Sherry insisted, Carole insisted, but I resisted and prevailed. No way. I didn’t want any part of it. A sixtieth birthday may be a time to celebrate, but with my son, Paul, dead less than a year, I just couldn’t do it. Believe me, Paul wouldn’t have cared, but, I did. I just didnâ€™t feel right having a party this year. Anyway, why should I worry about what they all wanted. Iâ€™m the one who turned sixty. I knew I made the right decision as we drove North on Friday. As soon as we got past Santa Barbara I started to relax, sink deep into my seat, take some long deep breaths and watch the beauty of the world go by. The verdant hills looked like they had been painted with sweeping brush strokes of mustard yellow, the rows of newly planted grape vines stood tall and proud, and the clear sky except for a few Georgia O’Keefe clouds beckoned us up the Coast. It looked like just plain heaven to me. And I figured that if it were this good on the road, what would come next would be even better. It wasn’t easy getting Bob to agree to go. Esalen, created in the 1960s where people gather to expand their minds, relax their souls, and work on their bodies; eat fresh, healthy food, and soak in the hot springs baths while watching the waves of the Pacific, is my place. I’ve gone there many times without him, and he is very happy to have it that way. But, this time he really had no choice. Of course, I offered bribes. He got to choose the workshop, he got to ogle all the naked women in the hot baths and he got to spend as much time with marvelous me as he wanted all weekend long. There would be no interruptions – no telephone, no email, no exercise classes, no work. What the hey? He took the bribes, and in his inimitable way, he came along and participated fully and willingly. Out of the four workshops offered this particular weekend, we decided to take the massage intensive. What a concept! We signed up to spend about nine hours taking turns rubbing each otherâ€™s bodies. How bad could that be? At one point I was laying on the table that stood right in front of a huge dome-shaped picture window, the sun was streaming in, a cool breeze was washing over me, the ocean was roaring below, and I was being massaged by not one man, but two. The instructor had decided to come by and give Bob a lesson in using a slow hand and an easy touch. Oh, and donâ€™t get any ideas. They each were doing a leg. Even so, if I could have my way, that moment would still be going on. 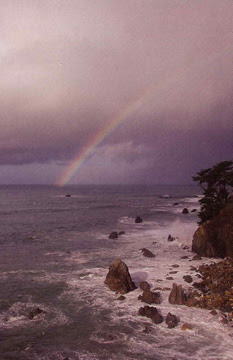 A poetry workshop at Esalen sounds excellent, Madeline! When I turned 60, I rode my bike from CO to San Fran. Now, I think I’d opt for Esalen. Relax and let your creativity flow. Barb, I’d love to meet up with you at Esalen sometime. I had a wonderful and productive time there. Plus nothing can beat it for beauty and a place of creative inspiration.